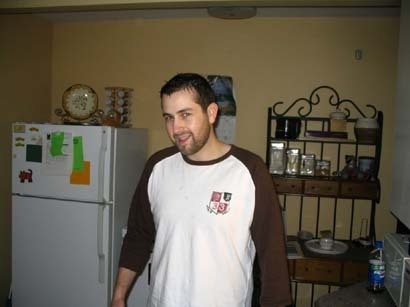 The week-end of the 25th to the 27th of November in 2005 will go down in history. Well maybe not in human history, but we had a good time. I posted the following pics with descriptions documenting our trip. Also note that John and Johnny are two different people. 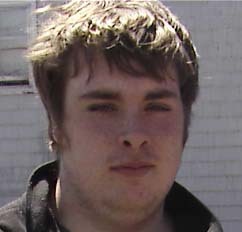 John had arranged to get 4 tickets to a maple leafs hockey game in Toronto on the 26th of November. So we started getting things on the go. We had little time to get the trip planned. A big thanks on this point goes to Johnny Kay. He took care of my flight tickets as well an ID card for me. There were 5 of us on this trip. Me, John, Katie, Johnny Kay, and Richie. Me and Johnny Kay had different flights than the other 3. Our flight was scheduled to leave at 6am. Everybody else was flying out at 7am. 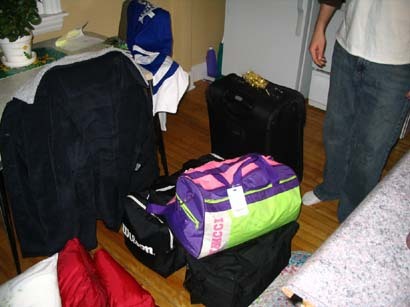 Here's all our bags packed at 4:30am. The suitcase with the bow is empty. It's reserved for clothes bought in Toronto. As it happens we used the empty suitcase to stow away our razors, since they can't be taken on board. Quite a suspicious package. 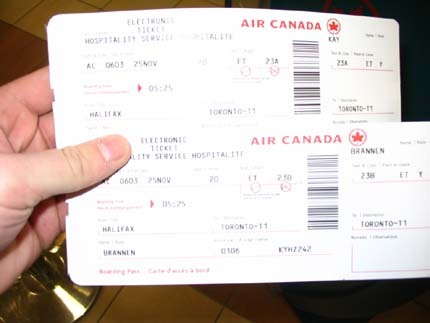 Here are mine and Johnny�s boarding passes. Once again we took an earlier flight than the other three. This is after we got off the plane in Toronto. Johnny is staring at the news while we wait for our luggage. I will explain at this point how big Pearson airport is. 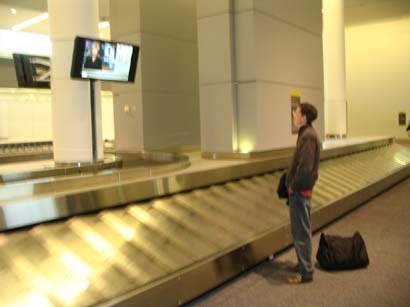 When me and Johnny got off the airplane we saw 13 luggage claim areas. We looked at the flight board and saw that the next flight coming in from Halifax was due in an hour. We thought it was john, Katie, and Rich's plane. It wasn't. Rich called Johnny's cell wondering where we were. Johnny explained, and Rich said they'd be right out... but they weren't. Rich called back; we were at the same airport, but different terminals. Me and Johnny were at terminal 1. Rich's plane landed at terminal 3. They had to take a shuttle over to meet us. It took the shuttle quite a while to arrive. 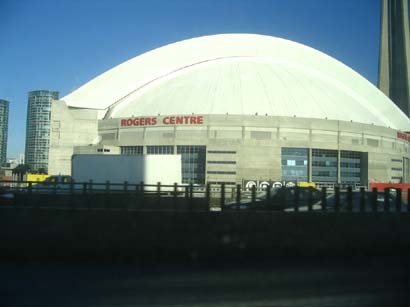 Here is the Rogers center from our cab on the way into our hotel from the airport. 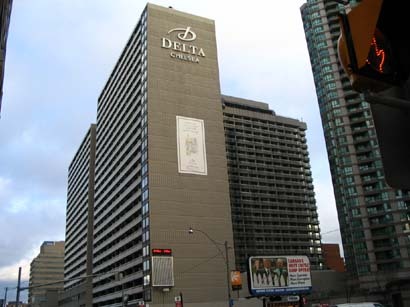 You could all see kinds of things, the Molson brewery, atlas cold storage, the air Canada center, the CN tower, and a sobeys store. 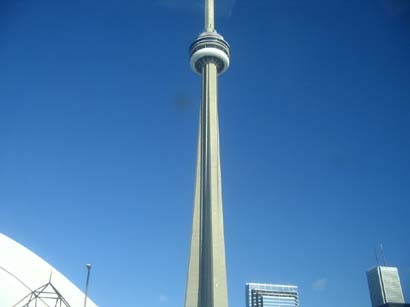 The CN tower from the cab. This is the view from our hotel room. 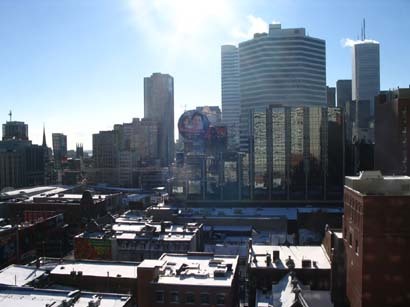 In the center of the pic is the Toronto version of times square. Anyhow, continue to page 2 to see what we did on our first day.